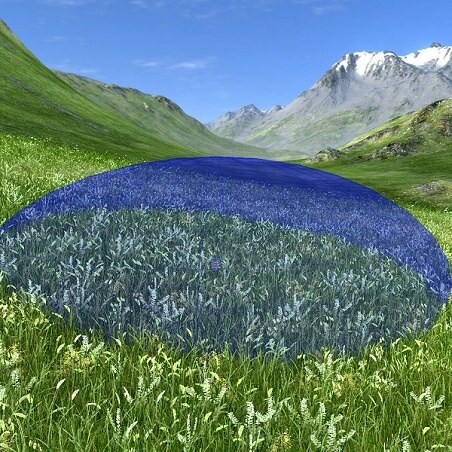 An animation field is an object, specifying geometry areas of grass and vegetation that should be animated. It affects animation parameters of leaf and stem materials applied to grass and vegetation. 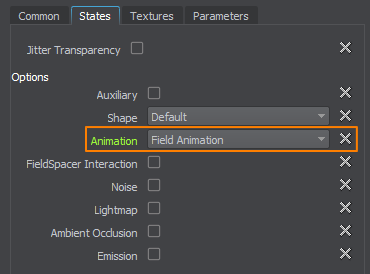 These parameters will be affected by the animation field only when the Field mode is set for the Animation option of the corresponding material on the States tab. An animation field can be used, for example, to create local rotor downwash effects on grass and trees. A FieldAnimation class to manage animation fields by using API. Add an animation field to the world: on the Menu bar, choose Create -> Field -> Animation and place the node in the world. The animation field will affect only those part of grass or vegetation that is inside it. 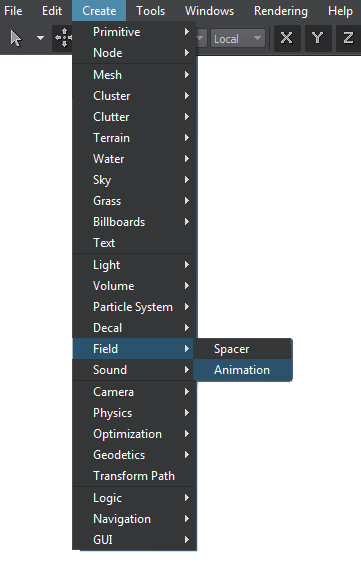 In the Materials Hierarchy window, select the material applied to grass or vegetation and go to the States tab in the Parameters window. Change the value of the Animation option to Field. This will allow the field to affect the grass. 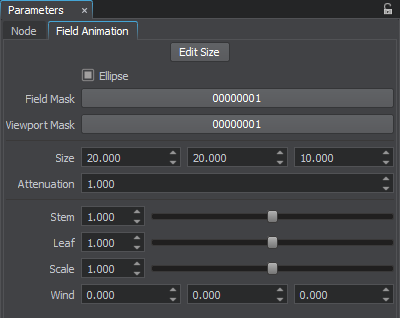 Make sure that the Field mask of the animation field matches theField mask of the grass object or stem and leaf materials (in case of animating vegetation). In the Field Animation tab of the Parameters window, specify the required animation parameters. For example, you can increase the Stem option to 3 so that the movement amplitude of the grass inside the animation field differs from the movement amplitude of all the other polygons. In the result, animation of the grass area inside the animation field will visually differ from the grass outside the field. Indicates whether the animation field is ellipsoid-shaped. If unchecked, the animation field has a form of a cube. A field mask. A bit mask that specifies an area of the animation field to be applied to grass or vegetation. The animation field will be applied only if both the field and grass (or vegetation) have matching masks. A viewport mask. A bit mask for rendering the animation field into the current viewport. For the animation field to be rendered into the viewport, its mask should match the camera viewport mask. Size of the animation field along the axes in units. 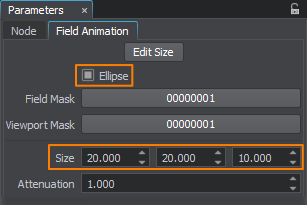 If the Ellipse option is unchecked, this is the size of the animation field box along the axes. An attenuation factor indicating how much animation attenuates starting from the center of the animation field to its edges. By the minimum value of 0, no animation will be visible. The higher the value, the more intensive animation will be at the edges of the animation field. 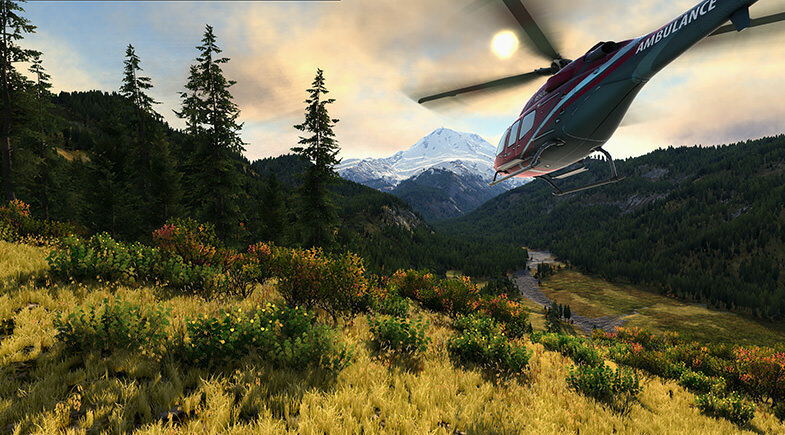 The field animation effect will not be multiplied by render vegetation animation settings. Scale for movement amplitude of grass and vegetation stems inside the animation field. Scale for rotation angle of vegetation leaves inside the animation field. Scale for speed of vegetation swaying. Wind direction inside the animation field.